Like 4 tuning forks in one! The SAF II is guaranteed accurate at room temperature to within 1/2 of 1 cent at A-440. Compact, lightweight. Produces pleasant overtone-rich tone on 4 notes: A4, A#4, B4, & C5. 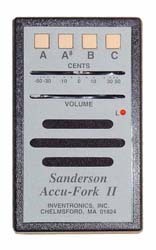 Features a 50-cents flat or sharp scale to allow measuring pitch of a piano. Perfect for pitch raising. Tuning Pins - Denro - /Doz.